Traveling through Mariners country today, an excellent excuse to point people to the blog 1977 Topps Updated and their treatment of Seattle's second expansion team. 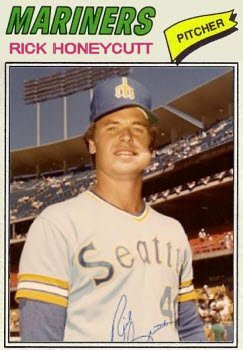 This pair of articles compares original Seattle Topps cards with updated custom cards and gives the "real photo" treatment to guys who missed the 1977 set entirely, including this chaw-enhanced Rick Honeycutt, one of my favorite early M's. I love to see this much work go into card posts. Check out 1977 Topps Updated for plenty more!